Long ago, it is said that there was once a huge lake in Rongjiang County, with three rivers running into it. In each river there lived a dragon and, every so often, the dragons would gather in the lake to play. One year, there was a thunderous monsoon that rained for nine days and nine nights, raising the water level of the rivers and disturbing the three dragons. The thunder became louder and louder, until eventually one deafening crash scared the three dragons so much that they all swam into the South China Sea, leaving behind only three precious treasures. When the Dong people’s ancestors arrived, they found each of the treasures and settled three villages there, as it seemed like an auspicious location. The three villages then came to be known collectively as “Sanbao” or “The Three Treasures”. Magical though this story may seem, there are actually about 19 small villages that make up Sanbao, with three main villages, known as Shangbao, Zhongbao, and Xiabao, being acknowledged as the treasures. When you live in a place called “The Three Treasures” and your village isn’t one of them, I can’t imagine it does much for your confidence! Overall Sanbao boasts about 2,500 households and a population of over 13,000 people, making it the largest Dong village in China. So, unless you’ve seen any Dong villages sprouting up near you lately, this means it’s probably the largest Dong village in the world. 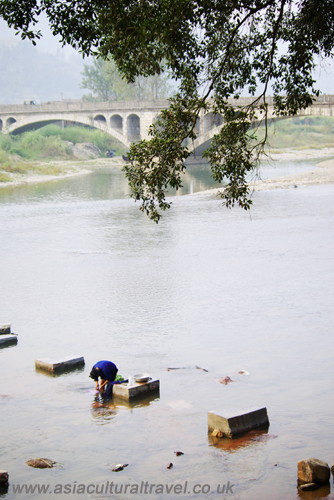 This cluster of villages is just 5 kilometres from Rongjiang City and lies along the banks of the Duliu River. Sanbao is flanked by stunning banyan trees, many of them over 300 years old, which stretch for over a kilometre along the river’s banks. Most of them were planted during the Qing Dynasty (1644-1912) and, after hundreds of years of uninterrupted growth, their roots and branches have intertwined lovingly. A cobbled path winds its way around these banyan trees, dubbed “Flower Street” by the locals, and at the end stands a statue of a man named Zhu Feng and a woman named Lang Mei, the veritable Romeo and Juliet of Dong folklore. When even the trees are embracing, you know that love is in the air! Aside from these marvellous natural wonders, Sanbao is resplendent with stunning architecture, including a series of drum towers that have earned it accolade over the years. The magnificent Chezhai Drum Tower was built during the Qing Dynasty (1644-1912) and it has remained undamaged for over 130 years, in spite of having been built without the use of nails or rivets. It towers in at 15 metres (50 ft.) in height but is tragically no match for the village’s local behemoth! The Sanbao Drum Tower, which was built in 2001, is over 36 metres (118 ft.) tall and holds the Guinness World Record for largest drum tower in the world. Though it’s not physically as large, this makes it taller than Buckingham Palace! Alongside these spectacular architectural achievements, the village also boasts nine temples dedicated to the goddess Sa Sui. She is one of the most important deities in the Dong canon and her temples serve as perfect examples of the elegance and decorative quality of Dong architecture. In a place this scenic, you’ll soon realise why they named it “The Three Treasures”. Let’s just hope the dragons don’t decide to come back!